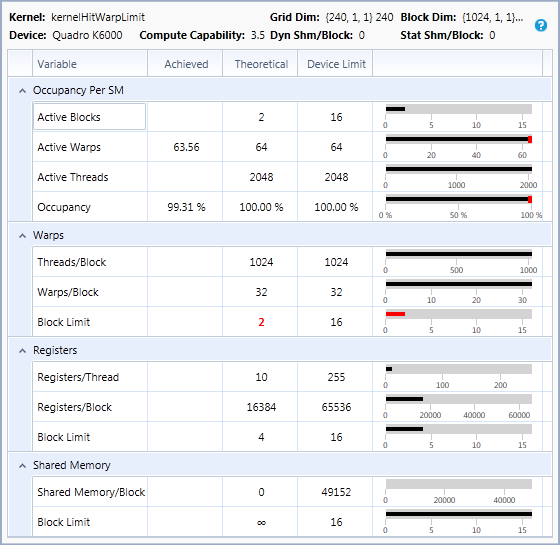 For all CUDA kernel launches recorded in both Profile and Trace modes, the Occupancy experiment detail pane shows "Theoretical Occupancy", the upper limit for occupancy imposed by the kernel launch configuration and the capabilities of the CUDA device. 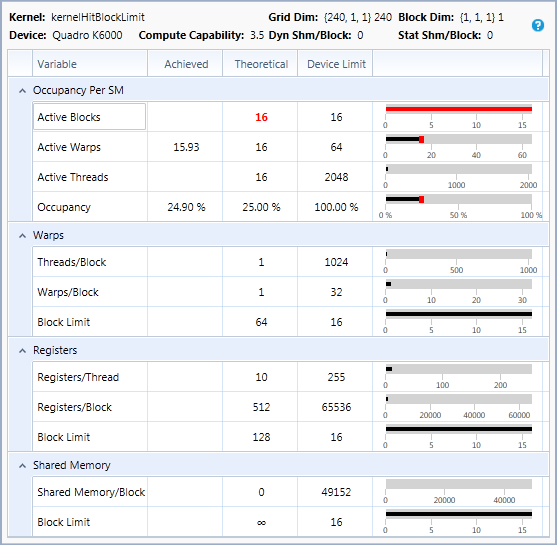 The Achieved Occupancy Profile mode experiment measures occupancy during execution of the kernel, and adds the achieved values to the Occupancy experiment detail pane alongside the theoretical values. Additional graphs show achieved occupancy per SM, and illustrate how occupancy can be controlled by varying compiler and launch parameters. The CUDA C Programming Guide explains how a CUDA device's hardware implementation groups adjacent threads within a block into warps. A warp is considered active from the time its threads begin executing to the time when all threads in the warp have exited from the kernel. There is a maximum number of warps which can be concurrently active on a Streaming Multiprocessor (SM), as listed in the Programming Guide's table of compute capabilities. Occupancy is defined as the ratio of active warps on an SM to the maximum number of active warps supported by the SM. Occupancy varies over time as warps begin and end, and can be different for each SM. The SM has a maximum number of blocks that can be active at once. If occupancy is below 100% and this factor is limiting active blocks, it means each block does not contain enough warps to reach 100% occupancy when the device's active block limit is reached. Occupancy can be increased by increasing block size. For example, on a GPU that supports 16 active blocks and 64 active warps per SM, blocks with 32 threads (1 warp per block) result in at most 16 active warps (25% theoretical occupancy), because only 16 blocks can be active, and each block has only one warp. On this GPU, increasing block size to 4 warps per block makes it possible to achieve 100% theoretical occupancy. The SM has a fixed amount of shared memory shared by all active threads. If this factor is limiting active blocks, it means the shared memory needed per thread can be reduced to increase occupancy. Shared memory per thread is the sum of "static shared memory," the total size needed for all __shared__ variables, and "dynamic shared memory," the amount of shared memory specified as a parameter to the kernel launch. For some CUDA devices, the amount of shared memory per SM is configurable, trading between shared memory size and L1 cache size. If such a GPU is configured to use more L1 cache and shared memory is the limiting factor for occupancy, then occupancy can also be increased by choosing to use less L1 cache and more shared memory. Theoretical occupancy shows the upper bound active warps on an SM, but the true number of active warps varies over the duration of the kernel, as warps begin and end. As explained in Issue Efficiency, an SM contain one or more warp schedulers. Each warp scheduler attempts to issue instructions from a warp on each clock cycle. To sufficiently hide latencies between dependent instructions, each scheduler must have at least one warp eligible to issue an instruction every clock cycle. Maintaining as many active warps as possible (a high occupancy) throughout the execution of the kernel helps to avoid situations where all warps are stalled and no instructions are issued. Achieved occupancy is measured on each warp scheduler using hardware performance counters to count the number of active warps on that scheduler every clock cycle. These counts are then summed across all warp schedulers on each SM and divided by the clock cycles the SM is active to find the average active warps per SM. 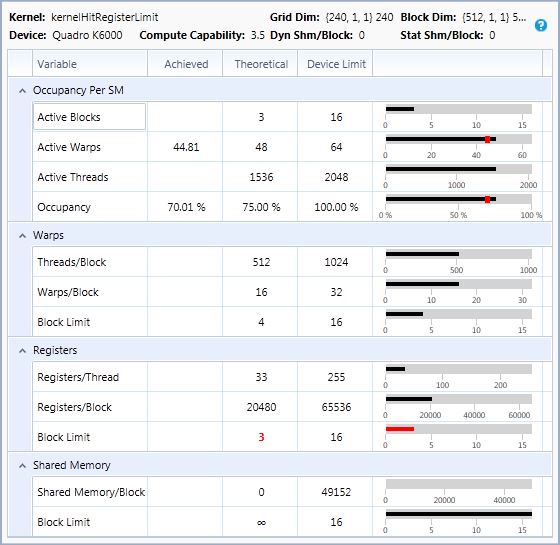 Dividing by the SM's maximum supported number of active warps gives the achieved occupancy per SM averaged over the duration of the kernel, which is shown in the Achieved Occupancy Chart. 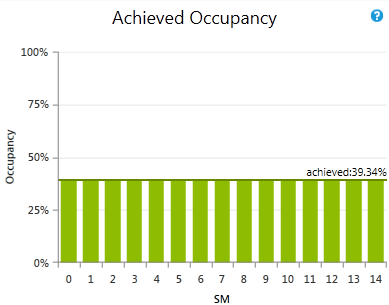 Averaging across all SMs gives the overall achieved occupancy, which is shown alongside theoretical occupancy in the experiment details pane. 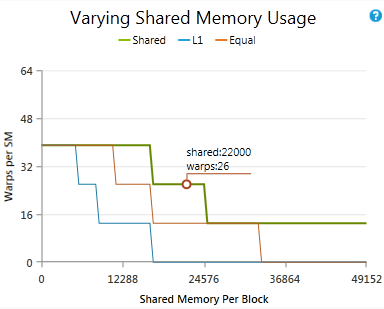 If warps within a block do not all execute for the same amount of time, the workload is said to be unbalanced. This means there are fewer active warps at the end of the kernel, which is a problem known as "tail effect". The best solution is to try having a more balanced workload among the warps in each block. The upper limit for active blocks per SM is determined by the theoretical occupancy, but that calculation does not account for a launch with fewer than that number of blocks per SM. The number of SMs on the device times the maximum active blocks per SM is called a "full wave", and launching less than a full wave results in low achieved occupancy. For example, on a device with 15 SMs, and a configuration expecting 100% theoretical occupancy with 4 blocks per SM, a full wave would be 60 blocks. Launching only 45 blocks (assuming a balanced workload) will result in approximately 75% achieved occupancy. Shows how varying the block size while holding other parameters constant would affect the theoretical occupancy. The circled point shows the current number of threads per block and the current upper limit of active warps. 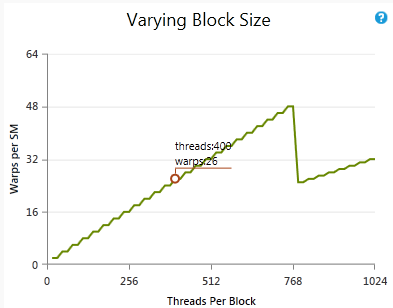 Note that the number of active warps is not the number of warps per block (that is threads per block divided by warp size, rounded up). If the chart's line goes higher than the circle, changing the block size could increase occupancy without changing the other factors. Shows how varying the register count while holding other parameters constant would affect the theoretical occupancy. 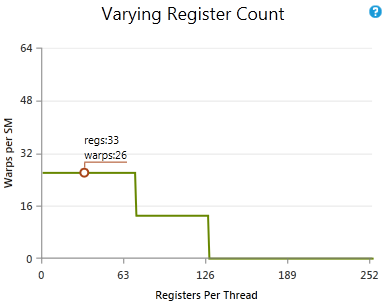 The circled point shows the current number of registers per thread and the current upper limit of active warps. If the chart's line goes higher than the circle, changing the number of registers per thread could increase occupancy without changing the other factors. Shows how varying the shared memory usage while holding other parameters constant would affect the theoretical occupancy. 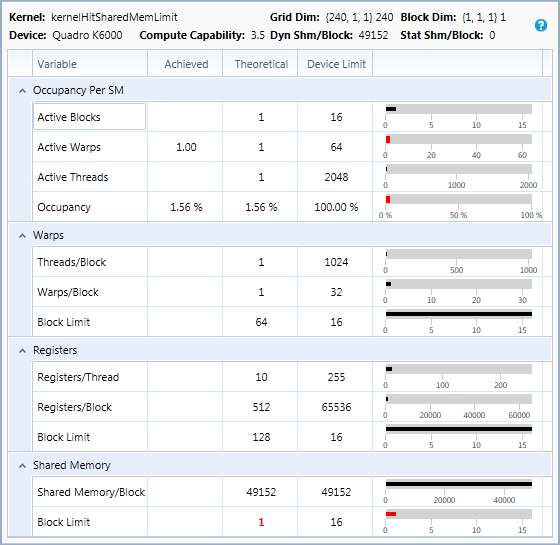 The circled point shows the current amount of shared memory per block and the current upper limit of active warps. If the chart's line goes higher than the circle, changing the amount of shared memory per block could increase occupancy without changing the other factors.